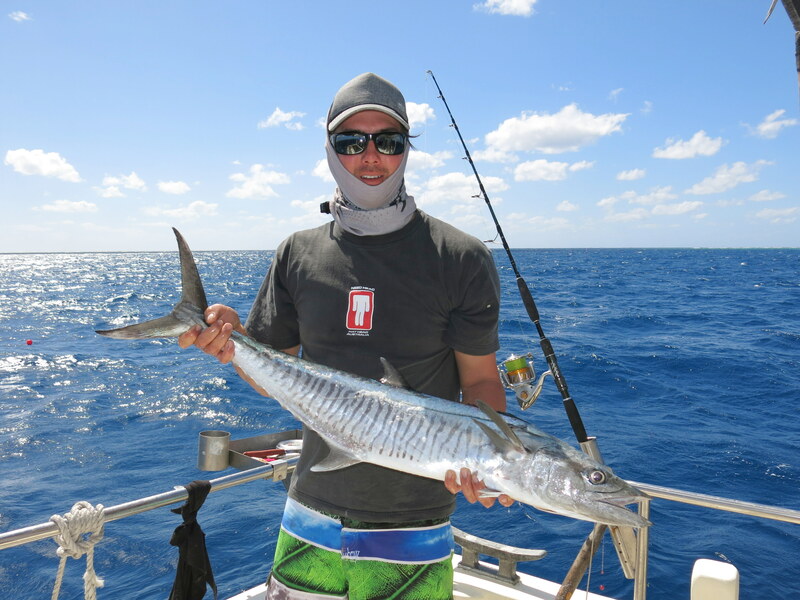 Tropical sportfish may be plentiful when conditions are perfect and a little bit more of a challenge when the gremlins throw a spanner in the works. But they are not stupid. They do not usually just eat any old offering and the best fish are caught on the best baits. The real secret is to use bait that is very fresh, not necessarily alive, but the best quality that can be found. On some days live prawns will be singularly attacked by all fish species, ignoring all other offerings. I have also observed the reverse in the Daintree river when the system if chock full of migrating prawns. The target fish species avoiding live prawns like they had the plague. An open, thinking mind is all important when fishing. Don’t be too narrow in your approach but remember the few basic rules mentioned above. Don’t forget to visit our bookshop for a range of books covering many aspects of fishing including rigs and knots, locality guides and species guides. Target species are fairly limited up stream in our pristine fresh water rivers and fish sizes are on the small side. Jungle Perch, Sooty Grunter and Sleepy Cod will all take offerings of red meat, local prawns, shrimp and cherabin (fresh water cray) and worms but it must be fresh. Barramundi can also be caught on live fish, small sleepy cod is an excellent bait and many local angler will target this species specifically using these fish. Shrimp and cray can be caught using “opera house” traps in the weed beds. This fishing zone, the inter tidal region of our local rivers and estuaries is probably the most accessible, and consistently productive area for anglers to target. Tides obviously play a major role in fishing success. The prime baits here are what occurs locally. Fresh live prawns would have to be the number one bait for all species. 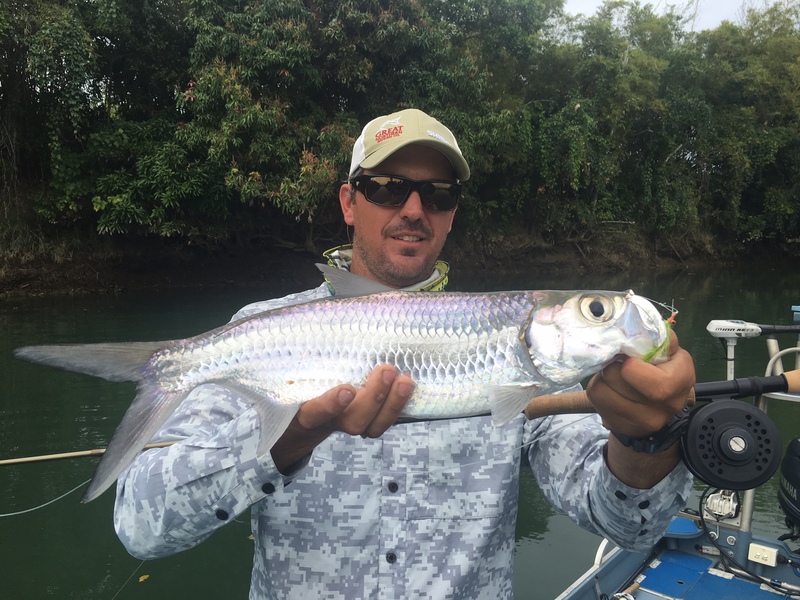 Whether fished in clusters on a 3/0 hook targeting Jacks, pinned once through the shell for bread and butter species like Grunter or Bream or using monster tiger prawns for Barra, they can be irresistible to fish at times. When they are running in our systems pawns can be easily caught using a cast net along the shallow mud flats lining the estuary at low tide. These nets are illegal in southern Australian states, but an approved and effective method for use up here in the tropics. Use a minimum 7 foot drop, ¾ inch mesh and practice your casting. Work the flats during the last two hours of the run out tide and the same period of the run in. Once cast, keep the top of the net low to the water to encourage the prawns to run up to the top and be trapped. Keep them alive in a well ventilated bait tank or pack on ice or wet newspaper to keep as fresh as possible. Any excess or prawns left over following the outing should be wrapped in newspaper and frozen. New in-possession bag limits (a maximum of one standard size two litre bucket) and net size limits apply. If frozen prawns are to be acquired check their quality carefully. Purchase only “clear” shelled prawns and avoid any pink or black looking offerings. Number two in the bait fish stakes would have to be the humble sardine. 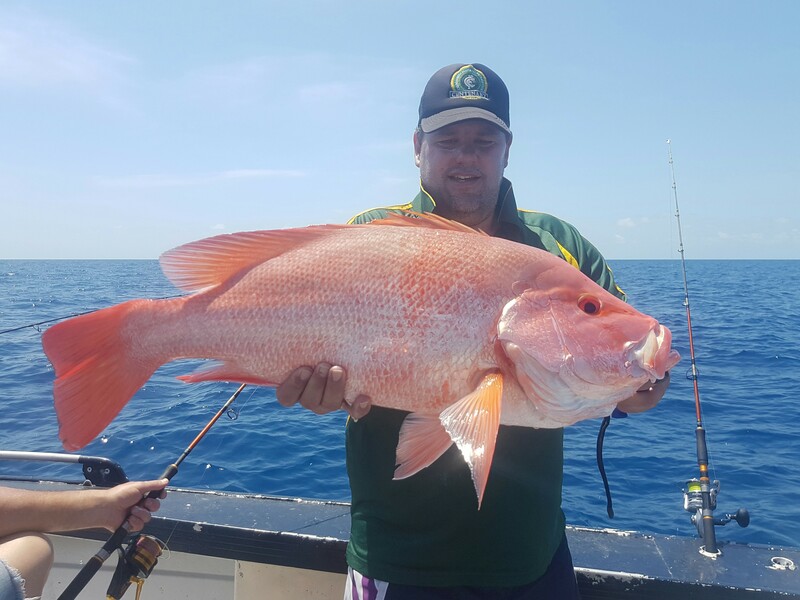 Found in prolific numbers during the cooler months, sards account for many prime fighting fish including Barra, Jacks, GT’s, Queenfish, Flathead and Grunter. Use either live pinned just before the eye to enable them to swim freely in the current, or butterflied with the flesh and gut exposed to allow the natural juices to flow. Sardines will bunch up at the upstream facing mangrove points on any incoming or outgoing tide, or any other structure such as fallen trees, pylons, and rock walls that offer resistance to the tidal flow. Use a cast net to trap these small fish, holding the cast net more upright to encourage the fish to mesh into the sides of the falling net. Take care with this method however as many an expensive net has been shredded and torn after becoming hopelessly entangled by the barnacle encrusted structure holding these schools. Mud herring and hardyheads (small fish) are also caught by similar methods, the mud herring becoming more prolific in the warm muddy waters on the flats during the summer months. Herring are probably best used using the butterfly method and are readily taken by most fish mentioned above. When in the system, Salmon find these baits irresistible. Other popular live fish baits include small whiting and mullet, the latter used frequently for old bucket mouth, the mighty Barramundi. 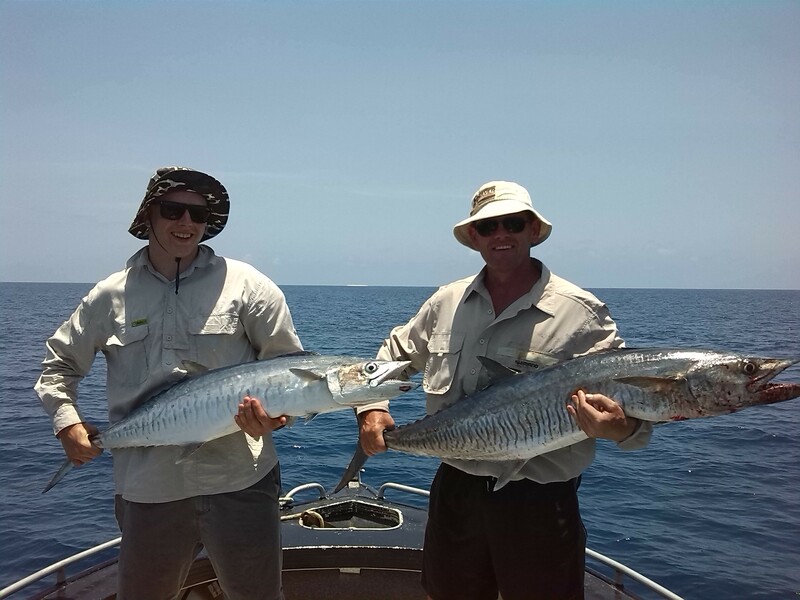 Although accounting for some surprisingly good quality fish at times, mullet is not as effective in our local waters as they perhaps are in waterways further south, or on Cape York for that matter. When targeting the larger specimens of your preferred quarry, a large slab or fresh fish fillet may be the way to go. Whole garfish sides offer excellent results. Once again if purchasing frozen fish baits, look for shiny sided, clear eyed fish that has obviously not been thawed and re-frozen too often. Squid and pilchard baits are not usually very productive in our tidal estuaries, small pickers will destroy the latter and these baits are primarily used out on the Barrier Reef. 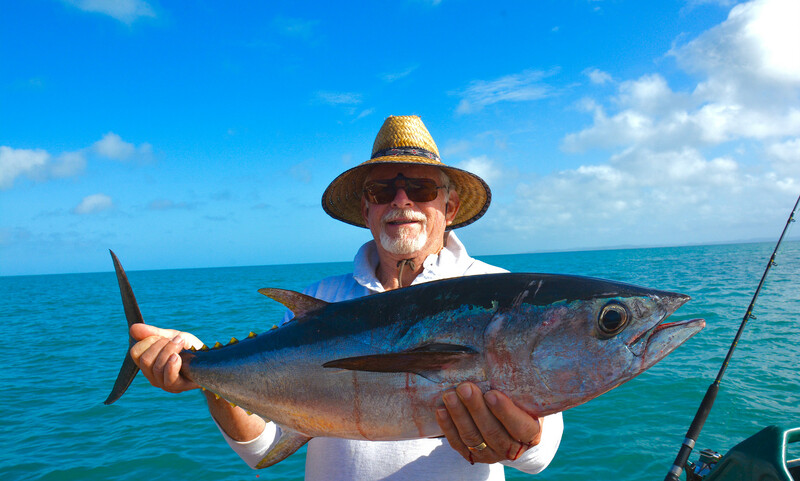 Most charter skippers like to offer their target fish a smorgasbord of fish chunks to chose from. This will include cubes and strips of fresh fish fillets, pilchards, squid and sardines threaded alternately on a 6 – 8/0 hook. The theory being the softer pilchard baits will be broken up quickly by any tentative bite or picker, causing a natural burley trail to drift on the current. The more pickers, the more burley, the more big fish! 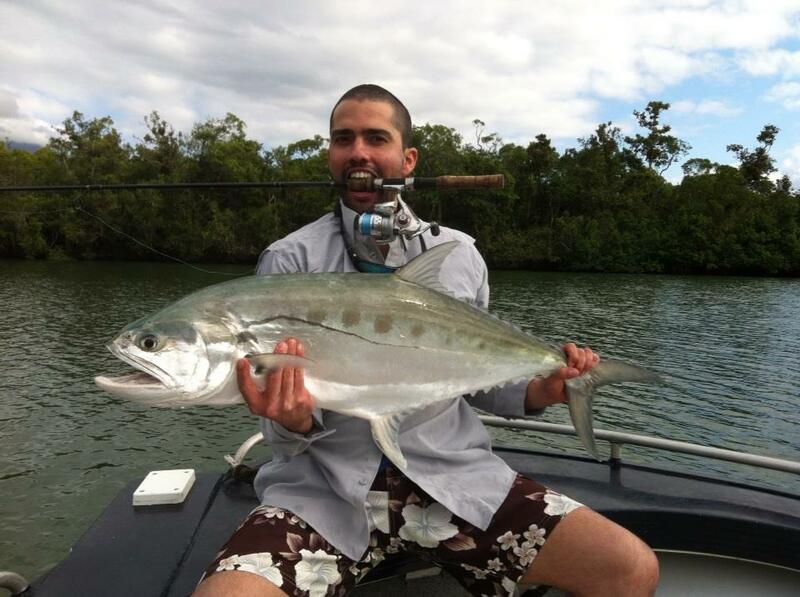 Any non target reef species can be used as fresh cube baits – just fillet leaving the tough skin on to hold the hook. Whole pilchard baits, gang hooked through the sides using No 6 hooks, with the last hook passing through the eye socket, is also a preferred method for Coral Trout, Red Emperor, Tricky Snapper and Spanish Mackerel.Use the freshest quality pillie available, easily detected by their shiny clear sides. Any old crumbly bait will break up too easily and entice only the small pickers leaving nothing left for the quality fish. Large mullet slab baits are also popular for our tropical reef species. Big fish require big baits. You don’t catch a 1,000lb Marlin on a sardine. Heavy tackle game charters will use surprisingly large fish baits at times including 20lb+ Tuna, Queenfish, Scad and Job fish. Expert rigging is required to enable these baits to either swim naturally through the surface layers or skip across the water and it is the deckies job to prepare these offerings. Smaller fish baits such as skipping or swimming mullet and garfish are used for the light tackle targets such as Mahi Mahi, Mackerel and Sailfish. The backbone of these baits is often skillfully removed to allow a more flexible and natural swimming action with a small sinker added to help the bait track upright. These baits are usually bridled and attached to the suitable razor sharp hook using cord and a bait needle. Garfish, pilchards, small queenfish, wolf herring and hairtail can also be gang hooked and either drifted or trolled dependent on target species.